With a Russian/Dutch heart: Preparations for spring time. What can I say about the weather? It hasn;t yet decided how to act for the coming week, I guess. Yesterday we had some wintery showers, but also blue sky and sunshine. Temps not all too high, around 5-6 C, and at night about 1 to -2 C.
Today it seems to get more quiet, more sunshine, almost not or completely no showers, very little wind. Then a few days with stronger wind and still a little bit of frost at night, but later it seems to get slightly "warmer"( at least no frost, yippee). What did we this week? Not so much, I can say, it was however a rather nice week. I did some household stuff here and there, tood an afternoon "off"and went to city centre and managed to come home with almost nothing bought LOL! I don;t need to do a lot of shopping for the weekend, just a few things like bread and cat food, that will get later today. My fridge is still filled enough and I have a lot of veggies lying there to be used. I think I will make a kind of Oriental soup for tomorrow, you know, with a lot of fresh veggies in it, a tiny bit spicy, simple but tasty and good enough for a Saturday evening dinner. Jan already got in a kind of Spring spirit this week. He prepared a lot of little pots with some soil and planted all kind of seeds. They are standing on trays nowsme of them in the room, some in the shed, well, a bit all around LOL. Then he screwed together the new rose bow I bought in a sale. It is not of the best quality, but it will hold for several years, normally, so good enough for me at the moment. Can you imagine that some of the seeds alreay are sprouting??? Gosh they are really quick. Hope they don;t grow too fast, because it is still too cold to put them outside. Monday Jan will have his doctor appointment for the result of the MRI. I also want him to talk to his doctor about his bloodthinners he is taking at the moment. Apparantly he has too thin blood because of him, so the trombosis service gave him a new schedule with almost no pills for the coming week. But he already is on another bloodthinner, so I guess that complicates the case a bit. May be he can skip the second one soon, and was it only temporary. Perhaps will go with him to his appointment, although I know he doesnt like that, hahaha. Okay, on to the freebie for today. 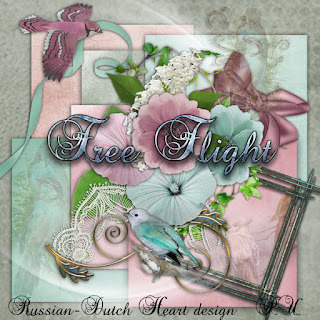 I've made a kit ( and did even some more designing again, which was a nice feeling), named it Free Flight. I first had another one, but then I saw I just forgot to make a preview of it, so I will do that this weekend. Oh, poor Arlene is feeling not well. First she had the flu but it turned out to a pneumonia. She is recovering already, but certainly needs some more time for it. So I told her to first take care of herself and recover completely from the pneumonia and gain force again and that the clusters can wait till she feels up to it again. I know how awefull you feel with and after a pneumonia, so her helath comes first, all other things can wait. I'm glad to see the Spring weather coming to you. I know what you mean about the seeds growing too fast. I have lots of plants poking through the ground, but we still have some cold weather to deal with before it stays warm. Last year, we lost a lot of plants. I hope this year is much better. I think I'd like to try planting with the bucket planters and a trellis. Anything that helps the plants to grow is worth trying. At least once. We'll see. I hope Jan's appointment turns out well and his meds are figured out. I have several pills to take, but I don't take them all. I only take what is absolutely necessary. I don't like taking pills to begin with. I think if God wanted us to fill up on pills, he would have given us a built-in covered slot on our body to put the pills in. Oh my, I can be bad. Kyra my friend, you have a beautiful day. Hugs, Edna B. Give Arlene hugs from me and I'm sending a prayer up for her. I know how it is with Pneumonia since I've had several times but not so much now that I'm all grown. But the Asbestos in my lungs is diagnosed as Asbestos Pneumonicosis. Just a big fancy word that tells me it isn't Asbestosis yet which is a form of cancer. and I don't need it. I friend had some spots on her lung and took part of it out and she is doing fine. Works the banquet rooms in a large hotel. Thanks for the new kit. I Love the colors.